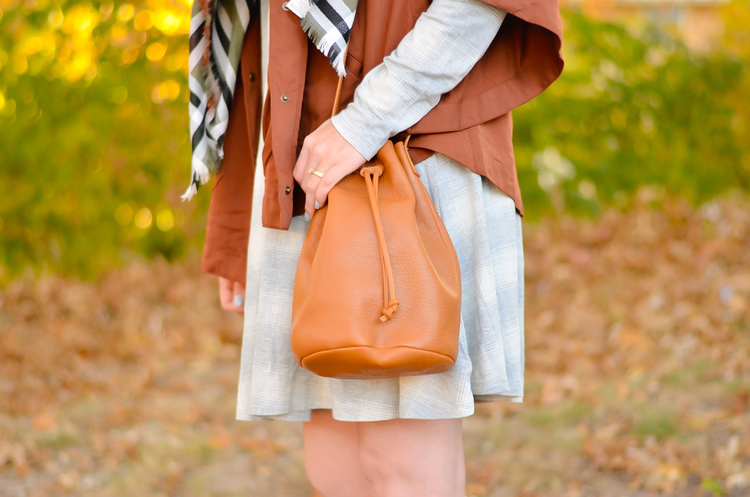 This is one of my favorite outfits I've shared on the blog, possibly ever. Maybe it was the gorgeous Fall colors in the background, or maybe the colors in the outfit ;) I have a serious love for the color orange, so I am very excited it's so readily available this season! When I was ordering this vest online, I needed to spend a little more to get free shipping (because spending $40 to save $7 on shipping is obvi the most logical thing to do...) and I stumbled upon this cape. I was skeptical of it actually looking cute in real life, but as soon as it arrived, I was obsessed. I've already worn it multiple ways, see instagram, and a couple of times I haven't had the opportunity to document. When I get something new, I tend to play dress up and make sure I can create multiple outfits with it. I had also recently ordered this dress and gorgeous leather bucket bag as well, and when I layered them up, I got pretty excited. All it needed was a pendant, I thought. As soon as I surveyed my accessories however, I realized this scarf was perfect. It introduces a subtle contrast to the plaid dress, ties together the gray and rust, and introduces some olive for interest. And olive is never a bad thing. Surprisingly this scarf has been on of my most reached for items this Fall already, evidently Instagram agrees because I see it on the regular in other people's feeds too. It's already sold out once, so if you need one in your life, I'd recommend scooping it up soon! PS- did you catch yesterday's recap of the St. Louis Kendra Scott Blogger Event? It was such a fantastic event! Great look, I can see why you love it! This look is so cute! That jacket is such a unique shape and color. Thanks for linking up to Top of the World Style. 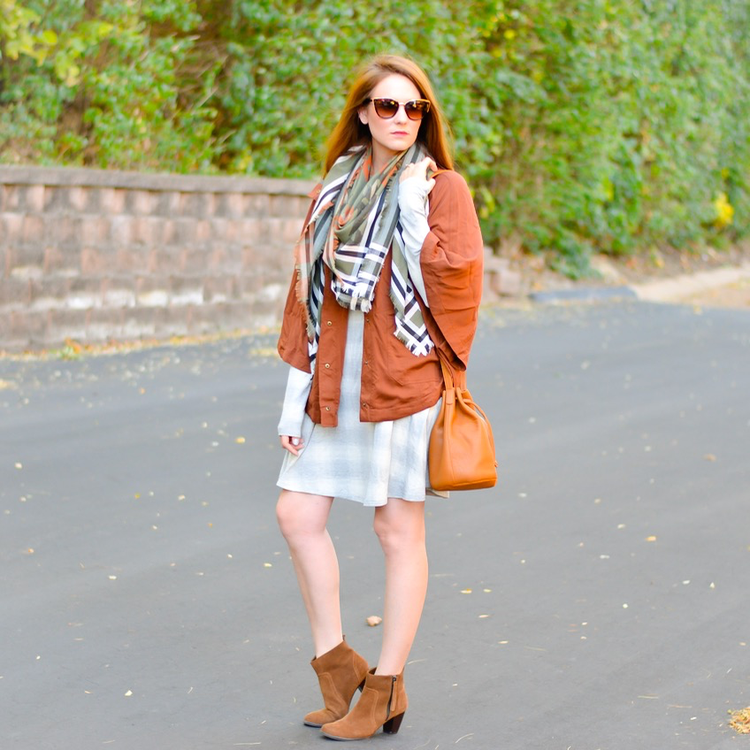 Great outfit for fall! Your scarf looks great on you! I love the colours. 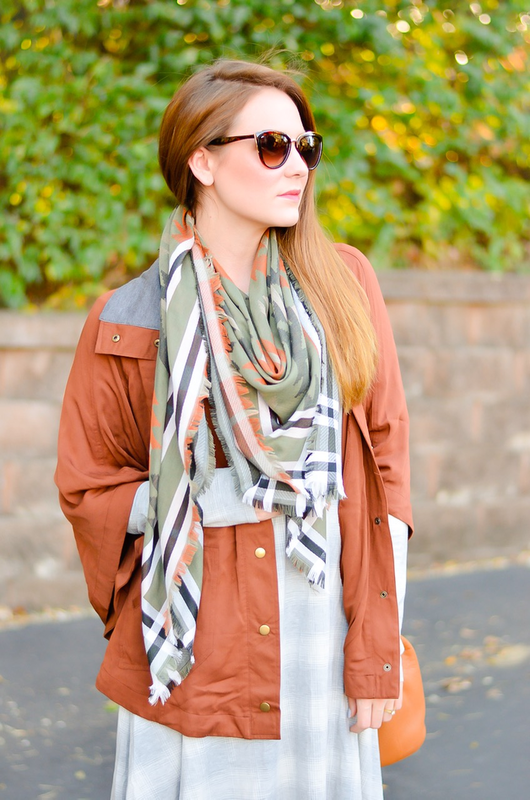 This is like the definition of a fall look! Seriously so effortless! You always pull off layers so easily! I really love this!